Pacific Women’s second progress report was launched by the Hon Julie Bishop, Australia’s Minister for Foreign Affairs, and Senator the Hon Concetta Fierravanti-Wells, Australia’s Minister for International Development and the Pacific, on 25 November 2016 – the International Day for the Elimination of Violence Against Women. 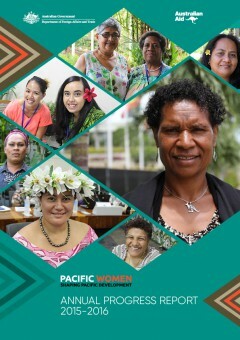 The Annual Progress Report, covering the period 2015 to 2016, features case studies that highlight the voices of Pacific women and men and the key achievements across the 14 countries supported by Pacific Women in the core outcome areas of: leadership and decision-making, economic empowerment, ending violence against women and enhancing women’s voice and agency. The report also reflects on lessons learned, key forums and events and considers the priorities for 2016-2017. Over the past year, Pacific Women has supported 9,320 women and children access crisis support services, 4,669 women take on leadership roles and 1,224 women access financial information and services.